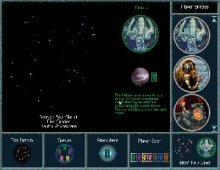 Ascendancy is an ambitious space strategy game that is full of innovative ideas. Unfortunately, it also has one of the worst computer AIs of all time. The AI was so bad that most gamers didn't even pay attention when the AI patch that fixes the game was eventually released. With the patch, Ascendancy finally is not only playable, but is highly entertaining. Ascendancy is the first game by Logic Factory, a small developer founded by two ex-Origin employees. The game looks like another run-off-the-mill space strategy game, but it successfully manages to add new elements that set it apart from other galactic conquest games. As in other "4X" games, you choose universe size, species, and even the general political climate. The choice of the species is interesting, because each species has a special ability you will discover only while playing. The tutorial is one of the best I've ever seen in a game: it covers all the game's basics and interface in a fun interactive scenario. Another great feature is the Research Tree, which is remarkable not only in its innovative 3D presentation, but also in the highly creative alien technologies you can research. Inventions may lead to other discoveries, and sometimes only a combination of different technologies can unveil interdependencies between technologies. You can rotate the Tree in all directions to explore the various topics. This is arguably the game's best feature, and one that should be emulated in later games. Unfortunately, the bucks stop here. Ascendancy's charming individuality and attractive graphics can't hide the brain-dead AI that poses no challenge whatsoever. The AI's incompetence is not so obvious in the first few turns, but after about 50 turns or so, it is glaringly obvious. While you amass your fleet to prepare for the invasion, the computer players will simply do nothing, oblivious to your moves and making no effort to defend themselves even when your fleet is knocking on the door! You'll wonder if the game has any AI at all, or if the computer can only perform mechanical tasks. If you get bored of micro-management, you can select the self-management option for the planets of your choice, as well as research. This sounds good, until you realize that it's basically useless since the computer cannot even manage its own planets properly. In its original incarnation, Ascendancy is a resounding failure despite a lot of hype. The amazingly bad AI (or lack thereof) really kills the game, which is otherwise full of innovative ideas. Fortunately, Logic Factory later released the AI patch that makes the computer a bit more intelligent (although, naturally, too late to make the game a commercial success). When patched, Ascendancy ranks as one of the most original space strategy games ever made, although even with the patch, the AI is nowhere near as challenging as, say, Master of Orion-- it just makes less stupid mistakes. Recommended, but only to beginners to the genre, or anyone who wants to try a unique space strategy game with a lot of individuality and not much of a challenge. Note: The Logic Factory's second game, Tone Rebellion, is a much better game than Ascendancy, although the AI could still use some improvement. Definitely worth a look at the company's website.